Charles Gates Dawes (August 27, 1865 – April 23, 1951) was an American banker and politician who was the 30th Vice President of the United States (1925 – 29). For his work on the Dawes Plan for World War I reparations he was a cowinner of the Nobel Peace Prize in 1925. 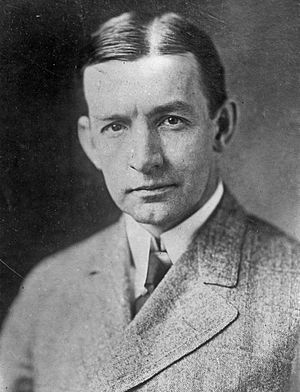 Dawes served in the First World War, was the Comptroller of the Currency, the first director of the Bureau of the Budget, and, in later life, the Ambassador to the United Kingdom. Dawes was married to Caro Blymyer on January 24, 1889, and they had four children: Rufus Fearing Dawes, Carolyn Dawes, Dana McCutcheon, and Virginia Dawes (Waller 1998: 273). 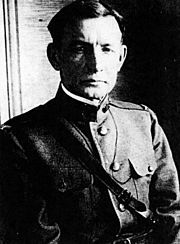 Gen. Charles Dawes during World War I. In 1925 he was a co-winner of the Nobel Peace Prize for his work on WWI reparations. In 1944, Dawes bequeathed his lakeshore home in Evanston to Northwestern University for the Evanston Historical Society (later renamed the Evanston History Center). Dawes lived in the house until his death. The Dawes family continued to occupy it until the death of Mrs. Dawes in 1957. Since then, the Evanston History Center operates out of the house and manages it as a museum. Designated a National Historic Landmark, the Charles G. Dawes House is listed on the National Register of Historic Places. Charles G. Dawes Facts for Kids. Kiddle Encyclopedia.